It took me a good chunk of time, but I finally decided on which planners and journals to use for 2016. My journaling setup is similar to the last year’s but I’m adding a few “upgrades” and slight adjustments to how I use each notebook (I'm calling them notebooks collectively, for lack of a better word). Here I’ll go over the different components of my setup, how I’ll be using them, and why I chose them. Previously, I wrote about my journaling here and here. This is a long one, folks. As before, I’ll be using Field Notes as my daily journal or log. Each day gets a date stamp at the top, and I jot down my activities throughout the day, including what I ate that day, weather information, and random notes. Some days require more writing but I’ve been trying to keep it as concise as possible. I also tape things like various ticket stubs and cool restaurant business cards inside Field Notes, if I feel they are too thick for Hobonichi Techo (discussed next). I use about two Field Notes per month, so obviously this portion of my setup will be replaced with different FN editions throughout the year. Ah, Hobonichi Techo. I used one last year as a journal (not a planner), and while I like it a lot, my relationship with its Tomoe River paper is a bit complicated (this will be a separate discussion for another day). And for awhile, I seriously considered the Midori MD Notebook Diary 1Page Per Day as a Hobonichi replacement. It has “regular” paper with warmer tone! In the end, I voted against it because I felt its design wasn’t quite what I wanted (too much blank space in the monthly views and cover not removable). The “Eureka!” moment that convinced me to stick with Hobonichi was when I took the decorative Cover on Cover and the black polyester cover off of it. I always liked the textured black exterior of the Hobonichi planner, but it was as if I’d rediscovered how wonderful it felt in my hands. I felt more connected to it, quite literally. That’s how I decided to give it another year. Plus two Techos on a shelf together would look really nice in the future, I thought. Hobonichi Techo is where I try to reflect on the past few days and try to put into words things I learned or highlight things that I want to remember later. I used to do more drawing in it but over the last 4 months, I’ve been writing more. I still occasionally doodle and decorate with washi tapes (note to self: start a separate sketchbook) but I keep it to a minimum. More writing in Hobonichi has allowed me to be a more concise with my Field Notes, too, so that’s slightly different from before. The point is for me to not repeat myself across two different notebooks. I shouldn’t try to “transfer” everything I write in Field Notes to the corresponding day in Hobonichi, and not always assign topics only to the days when they happened. Also, I don’t write in Hobonichi every day. Maybe 3–4 times a week. Muji Monthly/Weekly Planner in A5 and its label. I took the black PVC cover off. Weekly view inside the Muji planner, with graph grid on the right side. The design is very simple and straight-forward. This Muji planner is probably the biggest “upgrade” I added to my setup because it has weekly pages, in addition to monthly views. The A5 planner from Orange Airlines I used last year was thinner, with only monthly views. (The Muji planner seems sold out online; you might have a better luck at their physical stores, most likely at reduced prices by now). I know I haven’t talked much about using a planner before. That’s because I honestly didn’t know how I well I would use it last year. It was in my stash (bought solely for its removable, illustrated cover), and it had a free notes section in the back, so I decided to use it. (You can spot it in this post; it’s the dark blue green one with a pen illustration. Cute, right?). I ended up using it to mark birthdays and appointments, to schedule Three Staples posts, list monthly goals, and to write random thoughts and projects in the back. The planner was never intended to be an integral part of my routine, but at the end 2015, I decided I liked it enough to try another one this year. I like that I can review a month at a glance (bigger than what my Hobonichi Techo offers) and that it forces me to plan ahead. I used to do some planning in my daily Field Notes, but it was inconvenient for projects lasting longer than a day. I’m hoping that’s where the weekly pages in the new planner will come in. No more copying to-dos from one page to another. And it has more space for writing and possibly doodling. I'm still figuring out the best way to use this new Muji planner, but I am looking forward to it being an improvement over many different weekly planners I attempted to use in the past. For one, this planner is bigger, with the the days of the week (in equal size) on the left and a spacious graph-grid note page on the right. I feel more committed to the planning habit this year, too. And the paper in this Muji planner is fantastic, even for fountain pens, and feels very smooth. I almost went with a different, smaller planner sold overseas (it had a cute illustrated cover) but after checking the Muji's paper quality and design in person, and finding the Midori Pouch Diary in the same size (discussed below), I had to go with it. And its price of $12.50 USD was quite reasonable for an import. By the way, from the beginning I considered this planner to be an insert and made sure its PVC cover was easily removable. Midori Pouch Diary in dark denim (A5) and its label. It also comes in smaller, narrower format. The light button tab is leather, and the interior fabric is polyester. Another significant change to my journaling setup is this denim pouch for all the components I mentioned above. While browsing ideas, I came across so many Midori Traveler’s Notebooks in leather covers with various inserts that it made me want a similar setup of my own. Essentially a place where I can carry all daily notebooks in. (Why not use MTN? Its narrow format just isn’t for me). I’d already decided my Hobonichi will be naked, but I thought it’d be nice to have a place it could be stowed while I’m on the go. And then I spotted this denim Midori Pouch at my local Maido in the common A5 size, and I fell in love with its minimal look and zipper pouch. It also gave me the additional push to get the aforementioned Muji planner because I wasn't going to use its cover either! 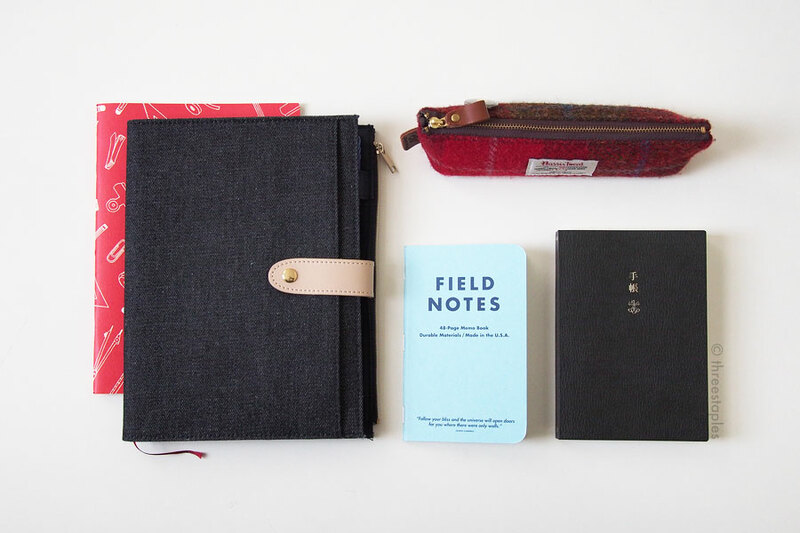 This Midori pouch came with its own inserts: a monthly planner and a ruled notebook with a generous amount of pages. And it was priced accordingly. But I took them out to make room for the Muji monthly/weekly planner. I felt guilty but it was still cheaper than leather options, and I really wanted to work with what I could find in person. So far, I really like it! Even with the Muji planner in the main sleeve, there’s still plenty of room for the Three Staples notebook in the back and another notebook if I want. A little more flexible in capacity and customizable than the Hobonichi cover. The zipper section is where I store my current Field Notes, and sometimes I put Hobonichi Techo in the front pocket (although it’s taken out in the picture below). Sometimes I put my iPad mini in it. There are business card-sized interior pockets, and I use them to store miscellaneous notes. Just like I wanted, this pouch is a cover for my monthly/weekly planner, as much as it is a place where other components of my setup can be stored and taken out easily. I’m happy with all the new things so far but choosing them was not a simple task. “You’ll be stuck with them for a year!” a voice in my head kept saying. And it wasn’t like one decision led to the next linearly. Analysis paralysis, perhaps. Imagine shopping for new planners and journals every year in Japan. How do you narrow down?!? First-world problems, really. Do you use multiple notebooks for journaling and planning? Are you doing anything differently this year with your setup? PS: I got Hobonichi Techo from JetPens which offers it at a very good price, and the Midori Pouch Diary is from Maido but last I checked in person, it was sold out. 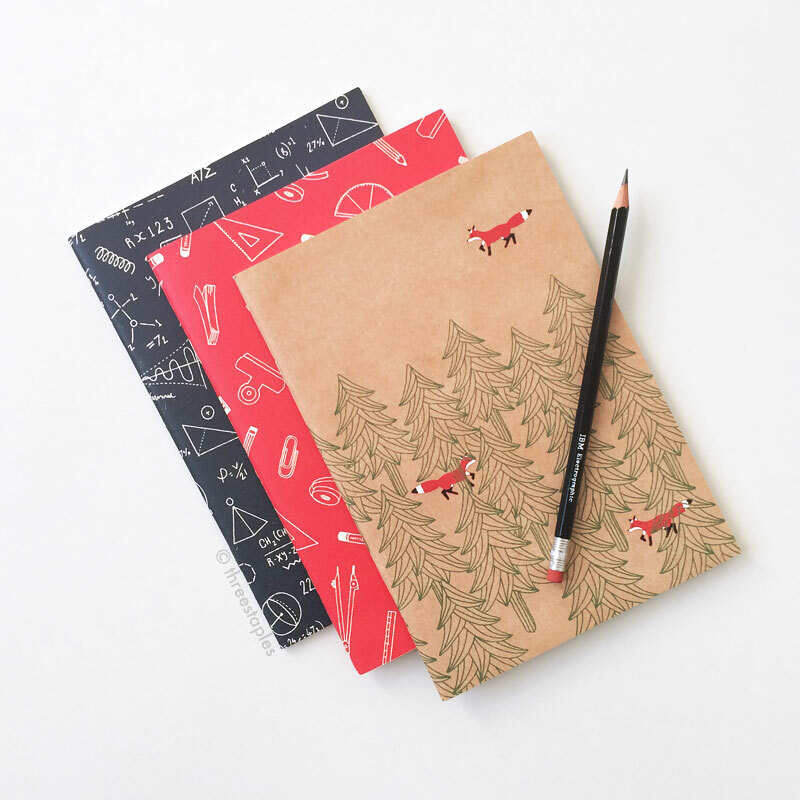 The cute Orange Airlines notebooks are available at both Maidos in San Francisco, in many different designs. The light blue Field Notes in this post is the “Flagged by Ellen” edition that was available through JCPenney many years ago.